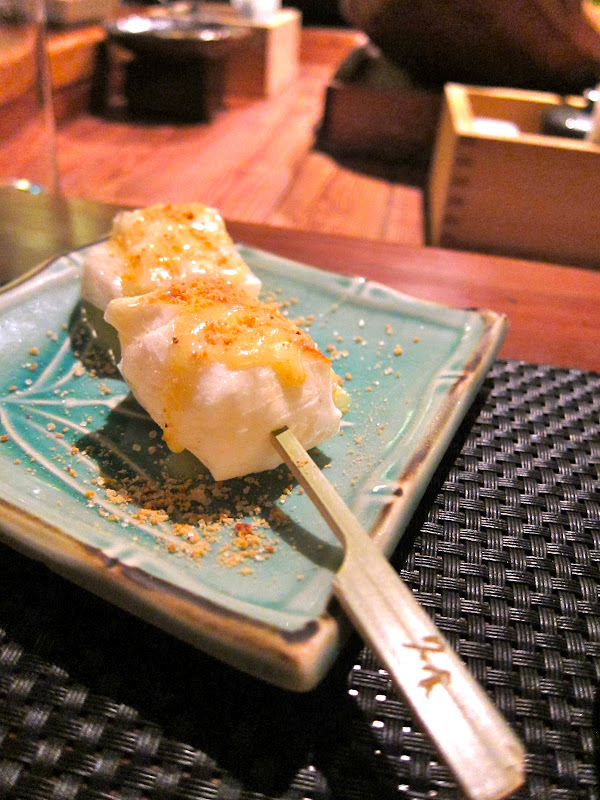 not taipei: BEIJING- where to eat? I'm going to Beijing next week for the first time since 2008! Where to go? What to eat? I'm meeting up with a good friend from LA and we'll be playing tourist. I've already got Da Dong Roast Duck reservations, but where should I go for dumplings, ja jiang mian and local eats? 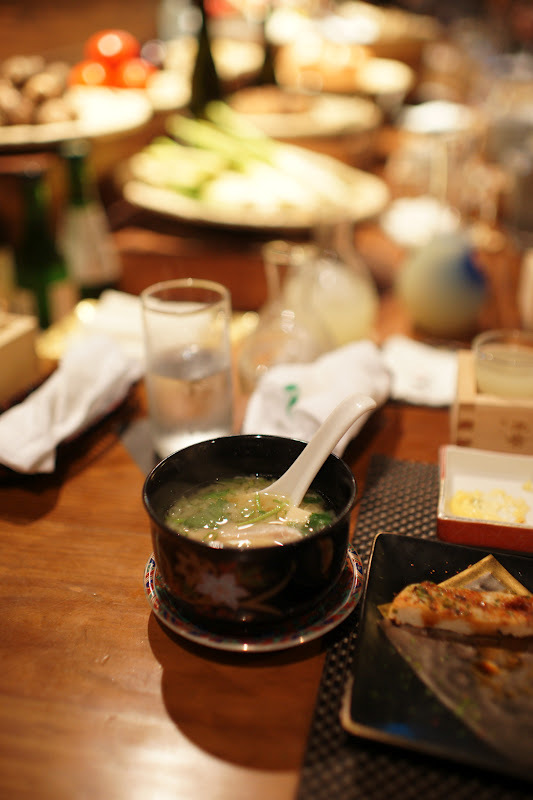 Robatayaki, yakitori-ya, yakiniku, izakaya... being in love with food means learning a whole new language- in this case Japanese. 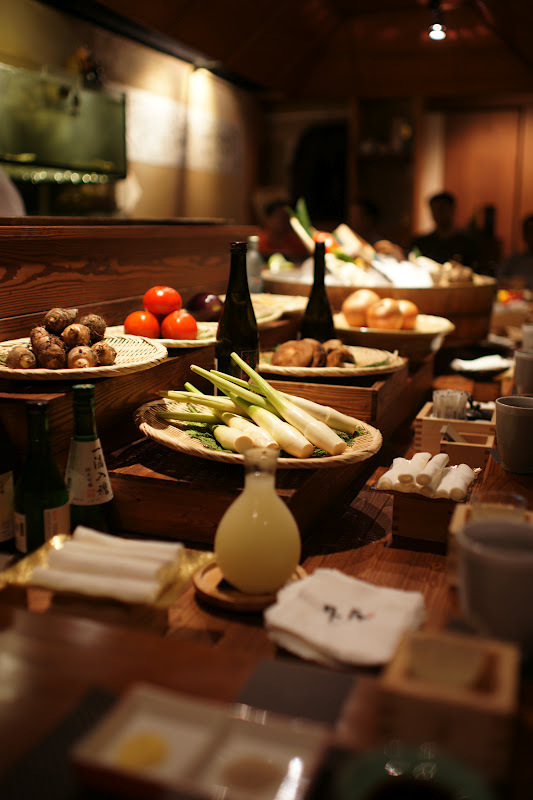 What is the difference between all these types of Japanese restaurants? 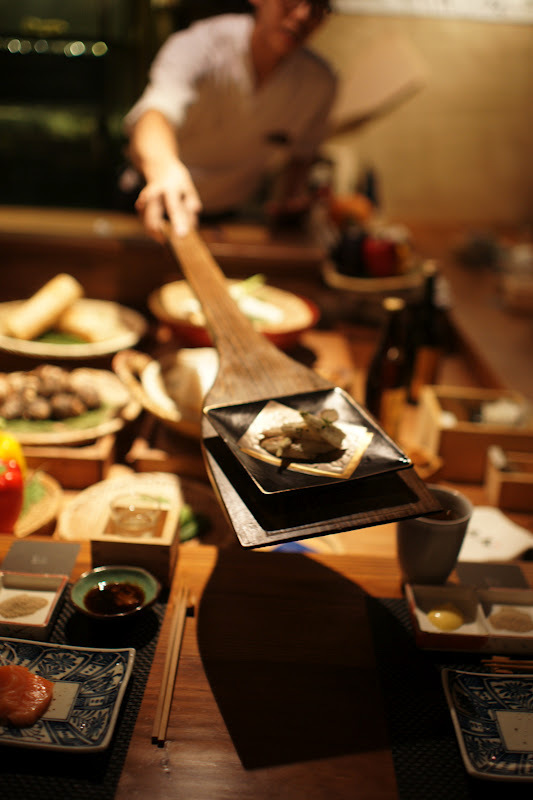 There's a ton of interesting restaurants along ShiMing DaDao or Civic Boulevard and of course not enough time to explore them. 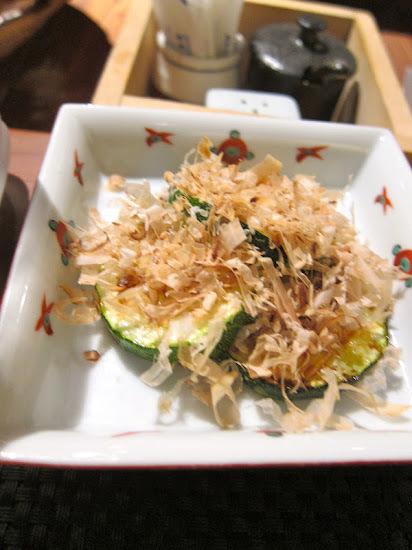 One of them is Robatayaki, opened by the owners of Ton 28 Sushi, featuring gourmet grilling Japanese style with sushi bar style seating where you can order from the chef. From the outside, it's hard to tell what's inside except that it's a Japanese restaurant. 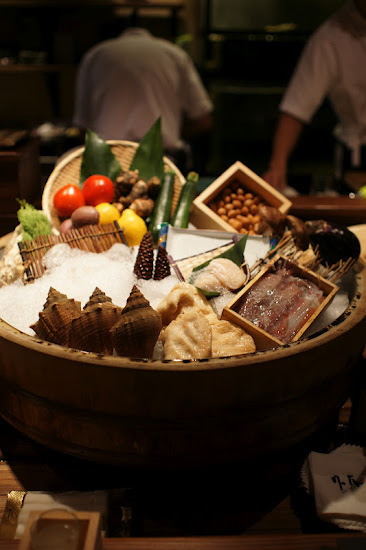 But once you step inside, there's a plethora of fresh vegetables sit in baskets along the long seating area, which can seat about 18 people. There's also some seating upstairs for bigger groups, but of course sitting along the bar is more fun. 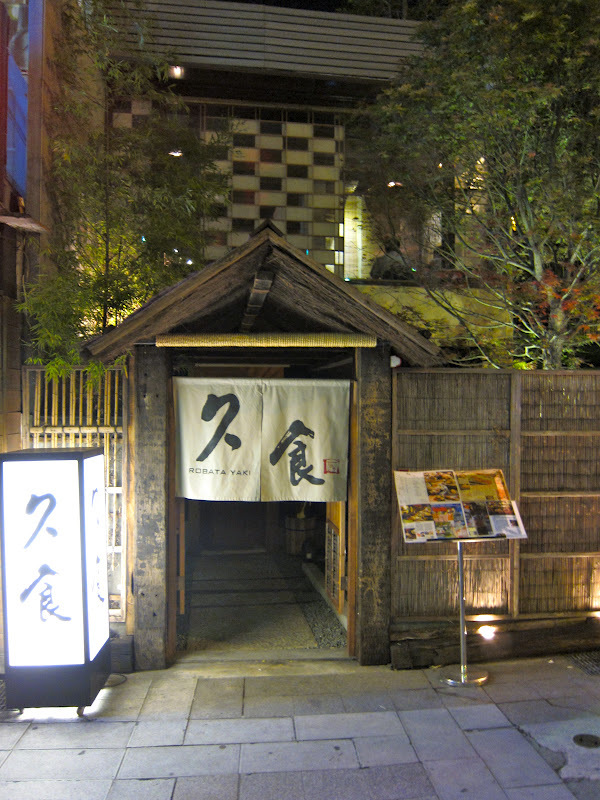 Rumor has it that there's also a separate room for VVIPs to have their own robatayaki space. 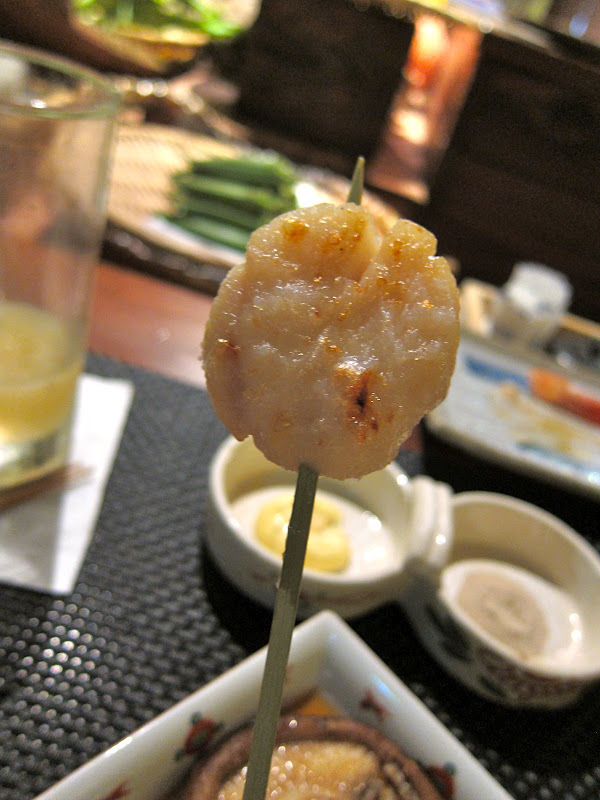 There's even some fresh seafood to choose from- scallops, oysters, shrimp and fishcake to throw on the grill. Diners can choose to order ala carte or a set menu. 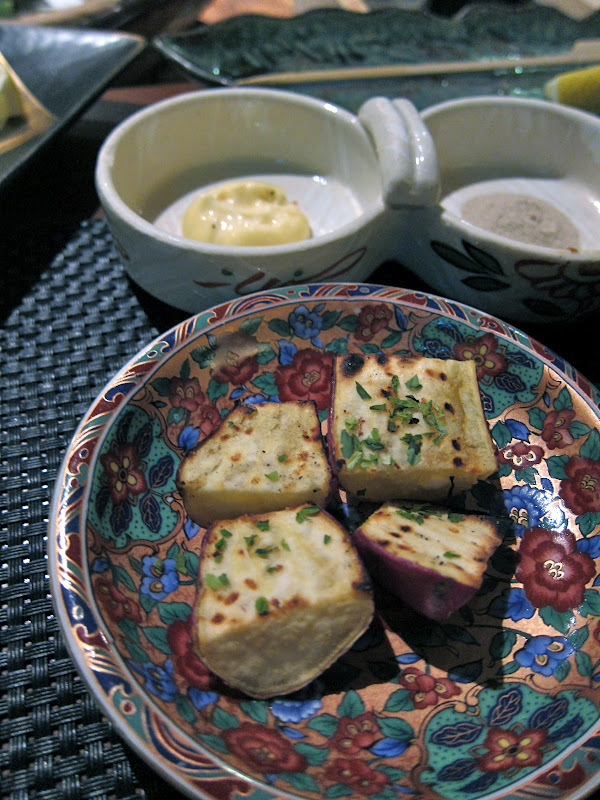 Sets will include small salad with light Japanese dressing and small amuse- in this case housemade tofu. Our set also included fresh sashimi- tuna, salmon and scallops tonight. If you're a fan of Ton Sushi, you won't be disappointed. 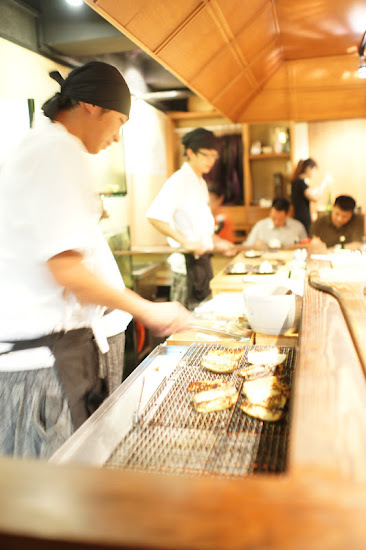 While there are a lot of Japanese/Korean bbq grill eateries where diners can grill themselves, Robatayaki has a hands on chef and one grill to cook for everyone. The benefit is that you don't have to do any work, the negative is that sometimes the food comes out quite slowly since there's limited space and one person doing the work. Then plates are served on a long paddle to each diner around the table. I've had a lot of skewer experiences, but this was a first for me. 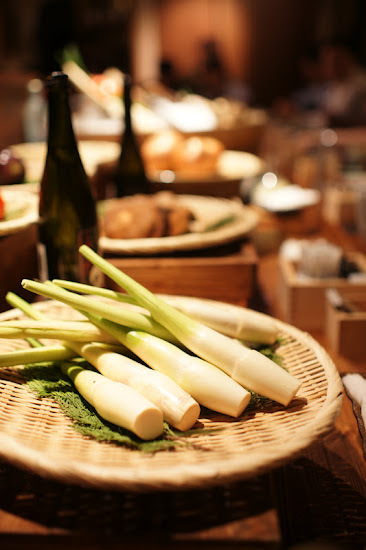 The fresh bamboo resembles an overgrown spring onion, with a thick white base and a longer green tail, before being chopped off and grilled. And this is the bamboo (NT$60) looks like after, with a slightly sweet flavor and crunchy yet juicy meatiness. 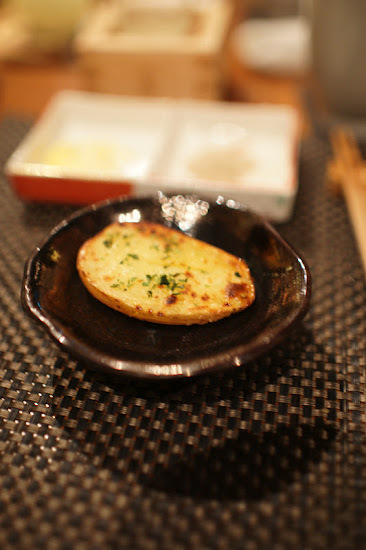 The grilled onigiri (NT$60/each) was one of my favorite things at Robatayaki. 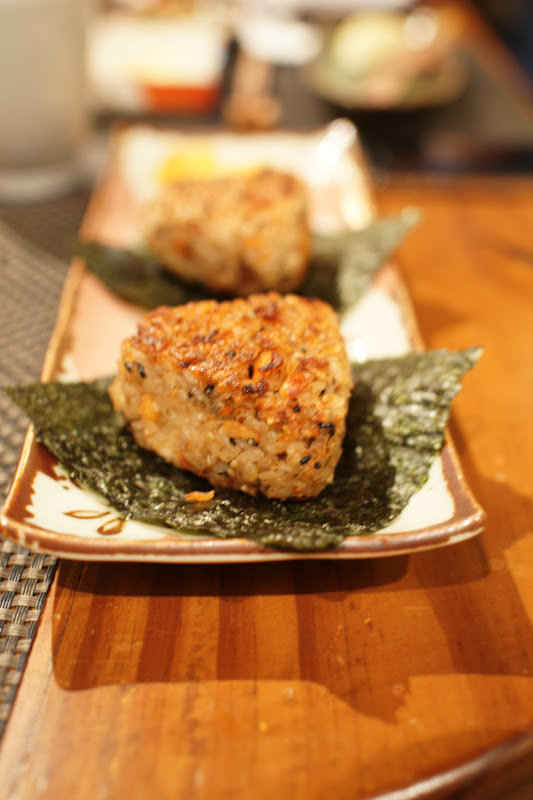 The grilling of the rice triangle made the rice crispy on the outside, stuffed with bits of salmon inside. It's a lot of little dishes to add up to one meal and some of the guys in our group were hungry even after our set menu completed, since after one meat skewer, it was all vegetables. Potentially this could be a great place for vegetarians. 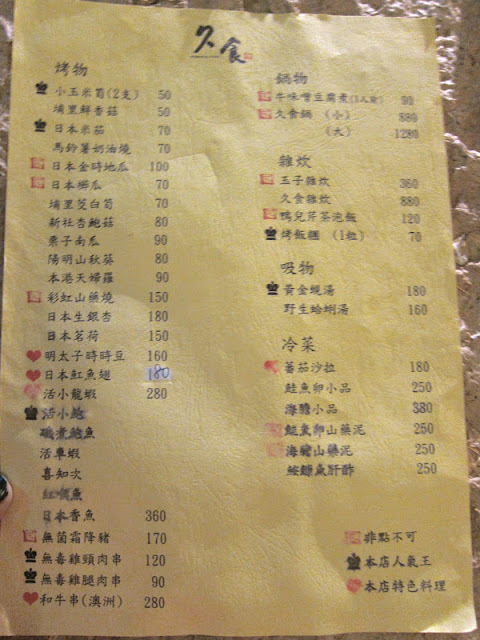 While it's not expensive per piece, say NT$50-150 per dish, the portions are small so it could add up to be really full. 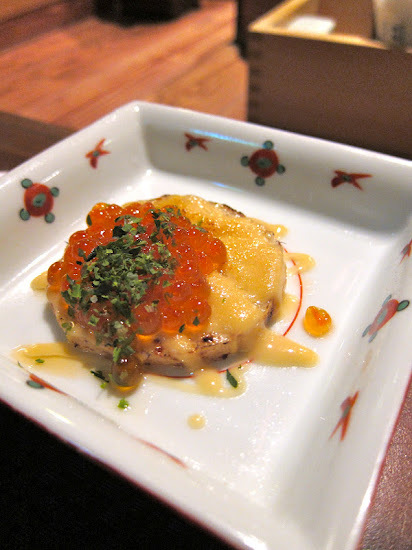 Another must order dish is the grilled mountain yam topped with ikura NT$150. 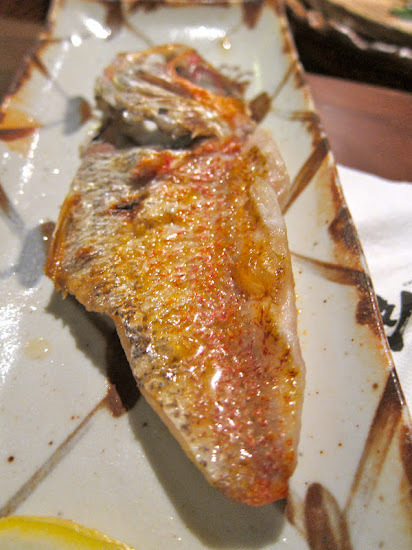 I also liked the grilled Keelung tempura (NT$90), which puffed up on the grill and had a slightly crispy charred "skin" to the densely chewy fishcake. 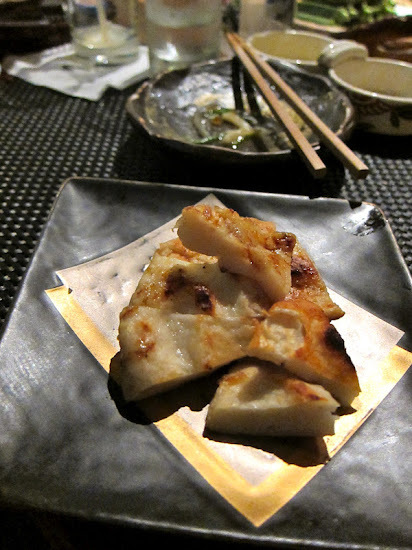 Order the grilled mochi to finish off the meal (I've also seen them give toasted marshmallows for kids. Cute). The emphasis here is definitely on vegetables and then seafood, with not a lot of meat options like typical Japanese barbeque places. You won't find any chicken liver or beef tongue here, so if you're better off elsewhere if you want to fill your carnivore cravings (Shinshengumi anyone?). Sets are available for NT$800-1600 with limited options, or you can just have fun ordering picking and choosing. 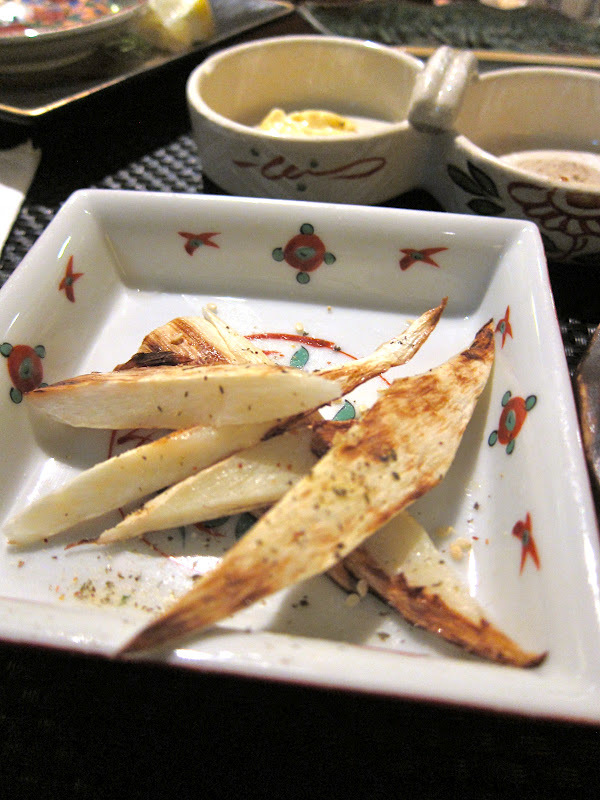 Some of the sets also include seafood not served up on a stick, but overall the grilled vegetables stood out more. 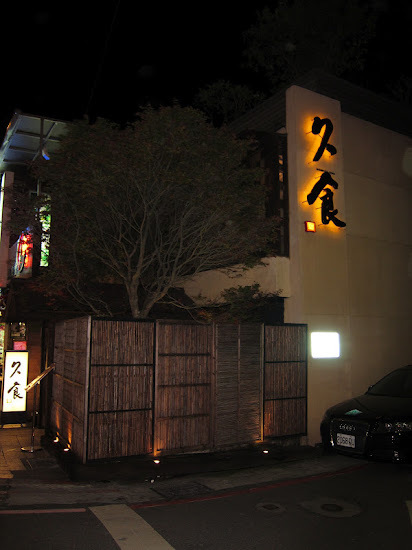 All in all, a cool place for a dinner date or to celebrate a birthday if you don't mind dining at a leisurely pace, drinking some sake while you wait for your food. The atmosphere is unique if you sit at the bar and I really haven't seen the paddle service anywhere else and the salmon onigiri really is delicious, so order a few extra to munch on throughout the night.